Among BetSoft’s lineup of 3D “Slots3” games, Mr Vegas is one of the standouts. Its glitzy presentation, unique bonus features and lively feel make it one of the most popular slots games you can play online. If ever there was an online slot that embodied everything we know about Sin City, then Mr Vegas is it. Hit the gaming floor, roll that dice and jump into this all-time classic slot. Just like the city itself, Mr Vegas doesn’t hold back on the glitz and glamour. From the moment the game loads and things kick off, you’re met with flashing paparazzi gamers, roulette tables, snazzy showgirls and, hopefully, Lady Luck by your side. With so much happening on the screen, you’ll need a solid internet connection, as BetSoft’s Slots3 lineup is notoriously demanding, with Mr Vegas being no exception. Mr Vegas is available for instant-play directly over your Web browser with no downloads needed. Mr Vegas himself might be a smooth operator, but his gamesake isn’t as easy on the eye. My initial moments playing the game were tough as I tried to grasp the game’s at-times obnoxious button and betting layout. The nature of 3D games like this means they often try too hard to incorporate that visual aesthetic, and in Mr Vegas case it means that some symbols and buttons overlap, which can compromise the seamlessness of the experience. This is where I feel Mr Vegas is let down: in an attempt to capture the glitzy nature of Las Vegas, it forced a steep learning curve on the player. Initial wins from Scatter symbols had me clamouring for information as to how I’d just won, while the introductory tune was nothing short of nauseating. Nonetheless, once you get beyond those initial challenges, Mr Vegas presents a wild gaming outing, with multiple bonus rounds, plenty of scatter symbols, and, if you’re lucky, some huge payouts. 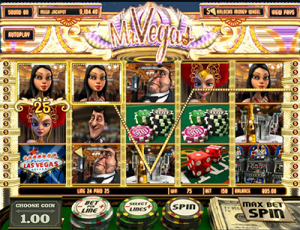 The gameplay is ultimately where Mr Vegas shines, even if is initially brought down by the game’s in-your-face attitude. There’s a stack of great bonus features to be won, as well as a progressive jackpot feature that kicks off a Big Wheel for your enjoyment. The wheel wedges appear on the top left hand corner of any random symbol (you’ll hear the “ping” audio cue whenever you land one), and five across all reels will unlock your chance to take home the jackpot. You can also land some free spins, so there’s a consolation prize if you don’t win the big one. You’ll need to be playing a maximum bet to win the jackpot, so make sure you’re playing five coins across all 30 paylines. Undoubtedly the best aspect of Mr Vegas (apart from the progressive jackpot, of course), is the unique bonus rounds. Scatter symbols can initiate a number of different mini-games, including a three-reel, one-line pokie slot, and a roulette table. These are fun bonus rounds that offer some unique gameplay from the base slot experience. There’s also Free Spins to be won, which are rewarded when a dice symbol appears next to a Mr Vegas symbol. Unfortunately, there are no Wild symbols during paid play in Mr Vegas, but that doesn’t mean you can’t win big. There are two mini-games, a progressive jackpot wheel, and Free Spins, so any lack of Wild symbols is made up in the abundance of Scatters you’ll most certainly land on multiple occasions. Mini Slots – Land three or more slot machine symbols across an active pay-line to start the in-game slot. This three-reel, one-line slot utilises the old-school cherries, sevens or bars lines to earn either free spins or credits. Roulette – Land three or more roulette tables on an active pay-line to start the in-game roulette game. You’ll get one chance to pick at least three numbers, with the payout generally in excess of 2000 coins if the ball lands on one of your chosen digits. Money Wheel – Mr Vegas’ progressive jackpot isn’t huge (generally between $10,000 and $50,000), but it’s still an attractive slice of the pie! Land three wheel wedges on any five symbols across all reels to unlock the Money Wheel and try your luck for the progressive jackpot, with free spins also up for grabs. Showgirls – Land five showgirl symbols to win the small jackpot of 2,500 coins. You can play Mr Vegas at many of our recommended sites, several of which all host BetSoft online slot software. All of our recommended casino sites are verified by industry watchdogs like eCOGRA, are safe and regulated for player deposits, and have hundreds more pokies on offer from BetSoft and other game developers. Our casino table at the top of this page lists all the best online casinos offering Mr Vegas for free play and real money bets, and has been geo-targeted to recognise your location and only recommend casinos that accept players from your country. You’ll either love or hate Mr Vegas’ animations and presentation, but if it’s the latter don’t let that deter you from playing one of the best slot games out there. The base experience is a lot of fun, with a varied betting range, plenty of unique and engaging bonus rounds, and some decent jackpots to win. It’s not offering the biggest progressive jackpot out there (far from it), but it still gets the job done across the board, even without Wilds to help work up those credits. It’s a lively, enjoyable and rewarding slots game, and like Vegas itself, is something that has to be seen to be believed. Sign up to play Mr Vegas and a large selection of other BetSoft games at Slots Million, where new players can take advantage of up to $100 in bonus money when depositing real cash for the first time. You will also get free spins to use on popular NetEnt slot games.